Catch a bus and travel past the famous Sydney Cricket Ground and Football Stadium, then the Royal Randwick Race Course before arriving in Coogee. 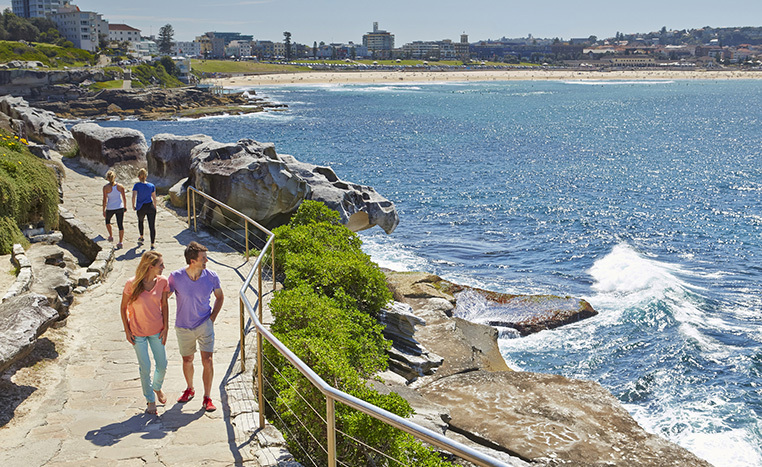 Walk along the Coogee Promenade then on to the Cliff Walkway to see picturesque views of the huge Pacific Ocean. Stroll past an old cemetery, then on to see samples of past “Sculptures by the Sea” exhibitions. Walk further to see the iconic Sydney Icebergs Swimming Club to finally arrive at the world renowned famous Bondi Beach. This is a chance to paddle, swim or just stroll along this lovely sandy beach to discover where you can buy takeaway fish and chips to eat while you sit and soak up the views and the atmosphere. There are beachside eateries where you can also drink a glass of wine and relax before departing to take the local bus heading back to the Sydney CBD. From the bus you will see the very large Centennial Park, the trendy up-market suburb of Paddington, and also the “nightlife” precinct of Kings Cross before arriving into the city.